I am so excited as I have mentioned to many of you that I have always wanted to write a cook book that is healthy and helpful for weight loss! Well I am happy to say …I did it! During so many of our sessions, and through email, and text messaging, we talk about food, and what the best diet is for weight loss…I try my best to give you the healthiest choices for the best results, but because the information comes in bits here and there it is sometimes difficult to retain the information. This menu plan is designed to compliment your training with me and accelerate your results, with 144 pages of recipes, nutritional tips, plus bonus workouts! I have included many pictures in these books as well!! take 10-35 minutes to prepare! In addition, throughout the book there is nutritional information on the health benefits of many of the foods, PLUS a list of my Top 5 Weight Loss Food Supplements, and of course, a grocery list! Bonus! 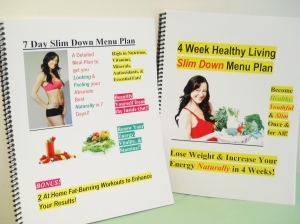 there is a separate book included…7 Day Slim Down Menu Plan this menu plan is also a detailed strict, yet healthy, diet to get you looking and feeling your absolute best for a special occasion, vacation, or upcoming event! This book is 25 pages & it includes over 20+ recipes!! Bonus! In this book I’ve included 2 At Home Fat Burning Workouts to Enhance your Weight Loss Results!! Attached is a couple of sample pics of segments from both books! Menu Plan is $150 (plus HST) Please feel free to share this special with any of your family and friends. I am certain that once you complete the 5 weeks you will have healthful tools & information that you will have for yourself always! Vancouver Personal Fitness Trainer: Angela Sasso Gets YOU Results! Today Dr. Oz 5 Fat Busters in 5 Days: Raspberry Ketones, White Kidney Bean and L-Carnitine!